Before the weekend is upon us, dear knitters, I have another giveaway for you this week! Tanis and Julie over at Tanis Fiber Arts have designed a set of four shawls and lace accessories for summer or light accessory occasions, all using different Tanis Fiber Arts yarns. They are all one-skein or two-skein projects and would be approachable for knitters looking to broaden their lace knitting skills. The Stella Collection is named for different star names (thus, Stella), but also Tanis’ sweet dog is named Stella, which is pretty darned cute I must say. I quite like the Adhara triangular shawl and the Solaria cowl (above), but you can check out all four of the lacy patterns in the E-book here on Ravelry. To be entered to win a copy of the e-book, leave a comment on this post some time before noon EST on Monday, telling me what your preferred kind of lace accessory is! I’ll draw a winner some time on Monday afternoon. Happy knitting this weekend! I hope you’ll get to enjoy some of the same fine weather we are getting in Southern Ontario this week. August has, mercifully, decided to be less humid and stifling than July and it makes for much more pleasant knitting time. I love lacy shawls. So interesting to knit and luxurious to wear. I love me some lace shawls! Thanks for the opportunity to win! I love shawls and am trying to decide on my first shawl to make that is not too difficult for a first try at lace. I’m a cowl person.. that way I don’t have to block for as long as I would a shawl! I am in love with wearing lacy hats and gloves. Just love it! And I really enjoy knitting lacy. I havnt yet tackled a shawl, but I would love to! I’ve just started knitting shawls, and would love to try the lacy ones! My go-to is lace shawls, but I’m also a fan of lacy hats that have really nice decreases. I love small lacy shawls, and the magic that occurs when they get blocked. Beautiful! My preferred lace is a long shawl that I can wrap around a couple of times. I love lace shawls, because fit isn’t an issue and they stay exciting through and through! They’re also more practical for TX than most winter wear. I love wearing lace shawlettes as scarves. 🙂 This pattern collection is beautiful! I’m a total beginner at lace, so don’t yet have a favorite lace accessory! I am, however very interested in learning more about lace knitting , as I’d love to add a shawl to my fall & winter wardrobe. Thanks for the give-away! I love lace, especially shawls and I’ve knit a couple of lace baby blankets. Lace is pretty much my obsession. I love shawls. I’m so glad they’re back in fashion again. It’s just the thing for so many situations. Definately my favourite lace accessory is a good old fashion shall!!! But also love the unexpected lace sock!!!!!! I love a shawl with a lacy border. I have reached the stage of life where my internal thermostat is up and down all day long. A lace shawl is the perfect thing to have with me. I enjoy knitting lace shawls and cowls, though I don’t usually wear them. If we’re talking lace things I knit and WEAR, I’d say scarves, socks, and headbands… Thanks for doing a giveaway! I love lace wraps — so versatile! I need more space to block things out on! So my favorite accessory would be an addition built on to the house, complete with lots of guest beds! I really like lacy cowls – they look so lovely and keep your neck warm, but there aren’t any loose ends to get caught in zippers (or mugs of tea). My preferred lace shawl accessory is a large circular type with a pin thru it to hold it in place, I love shawls and are addicted to knitting them. I’m thinkin’ Christmas presents for everyone. I love adhara. Lace shawls would seem to be the first answer, but if I’m honest lacy fingerless mitts are becoming a fast favourite with me. Wonderful giveaway, thank you. I love lace, especially shawls. There’s something so inherently feminine about wrapping a shawl around your shoulders…just make you feel good. I just started knitting and lace shawls are next on my list to learn. The ones you shared are just lovely. They add such a beautiful accent to your outfit. My fav is lacy fingerless mitts. Thanks! I am totally hooked on lace shawls, especially the semi circular ones…LOVE LOVE LOVE them…and I’d be lost without my big 2′ x 2′ blocking boards. You can never have enough shawls. So much fun to make and so girly to wear. I love lace shawls and blankets… I think knitting lace with heavier yarn is a lot of fun! I’m just finishing up my first lace shawl and am very much looking forward to wearing it. I’ve knit (and given away) lace sweaters in the past. What a lovely collection! I am currently enamored with lace wraps…long, rectangular wraps that can be worn several ways. Versatile and feminine. Time-consuming to knit, but so worth it! I enjoy lace knitting in every form. Stoles and shawlettes do take first place; they are so much fun to knit and wear. I love lacy socks, they feel so elegant even when I’m just puttering around the house. I love lace shawls, fun to knit but I’m finding they’re not getting enough use so I might have to start thinking about cowls too. Lace shawls are my first choice with scarves a close second. I love small shawls to wrap around my neck an shoulders. I love to knit lace shawls, socks, sweaters…yummy lace. My favorite lace accessory is always a shawl. Can’t get enough shawls! Lovely lace! I have to say my favourite shape at the moment is the crescent (I also really like the elongated shallow triangles) but these are both patterns I would knit, they are very pretty. I quite like shawls, there are so many different patterns out there you can never get bored! Like many others, I’ve not tried lace yet. But I need to expand my horizons! Those are gorgeous. I am a Tanis Fiber Arts addict and hope to knit her wrap from this collection soon. I love lacy wraps. I think a lace scarf is the way to go! I do love lace shawls! Thanks so much for such an awesome give-away. I love the look of a lace shawl but have not trie to make one yet. It’s on my “to do” list! I like lace shawls and socks. I have not tried lace knitting yet. This will be my next project to learn in my new favorite thing to do: knit! I enjoy a challenge so each project I do I want it to teach me something new and knitting that gorgeous Solaria cowl could be just that project. Lacy shawls are super pretty. I just wish I had more excuses to wear them. I love lace shawls… they are all so different and so pretty! I dream of shawls – big, small, simple, breathtakingly intricate…now if I could just get past the row thirteen on the chart, I’d be all set. looks like a lovely pattern book! Thanks for the chance to win. Just finished my first shawlette: Gloxinia Shawlette. Now working on Haruni. I love lace shawls…they are so beautiful. I wish I was the kind of person who knew how to wear them! I love lace shawls. I use them when I need some knitting I need to think about. One day I want a really big, thick cream shawl that I can snuggle in during the winter months. Sadly, my queue is too long for that, but these Tanis shawls would be perfect Christmas knits. I favor a lacy shrug for the summertime. I love and enjoy wearing lace shawls. It’s fun to knit them, too. It’s always lace shawls…especially enamored with the one-skein variety! I love solaria! although all are beautiful! Wow…what beauties! I think they are all my favorite! I prefer a lace scarf! Shawls are my favorite…quite the challenge but beautiful and rewarding! me too me too me toooooo ! Lacey cowls are my favorite. It’s a good thing I like making them because my daughters keep “borrowing” them! I love lace wraps esp here in Texas where it’s been 100F for days, but inside, the A/C is chilly. I made the Wisp as a first project and am now trying the Forest Canopy. thanks for the give away! I like cowls because you can put them on and not have to worry about fixing them or if they’re hanging weird. And they keep the back of my neck warm! I will be blocking my very first lace project (a scarf for my mother) this weekend. It not only taught me patience and persistence, it taught me the benefits of taking my time and using lifelines. Good advice for life, not just knitting. I love lace scarves! They are so versatile, and especially when made out of lighter yarn for summer, they add depth and interest to a simple outfit, without adding too much warmth. I love shawls. They are a great way to buy just a bit of yarn without breaking the bank. I love shawls. The drape and the stitches….. heaven. My favorite wearable lace is a triangular lace shawl. I like small rectangular lacy scarves too. Thanks..
Like so many others before me I’d have to say lace shawls. Add me to the list of lace shawl lovers!! Lace shawls are always perfect – must be why so many of us love them like we do! Lace shawls are my favorite accessory to knit. Just finished Kieran Foley’s High Seas and it was great fun. The only lace I’ve done so far was for shawls, but I’d really like to incorporate some into the edging of a shell or cardigan. As so many before me have said, a hint of lace in an outfit adds the pefect amount of feminine elegance. I’ve just started a scarf but have made only triangular shawls before.l I do love the way the triangular shape grows. I’ve never knitted a shawl. Would love the opportunity to try. I think I prefer lace shawlettes! Thank you so much for the giveway! Have a wonderful weekend! I like all kinds of lace accessories, but I get the most use out of the smaller triangular shawlettes that I can wrap around my neck like a scarf. Definitely very long, rectangular lace scarves. They are my favorite to knit and to wear. Triangular shawlettes are nice as scarves, as well. Shawls, without a doubt. How do all of those holes add up to so much warmth? Ooh, lace. I love a good shawl. I’m currently working on a lace sweater, which is super fun. I love the 2-tone effect of Adhara! I’ve been looking for just the excuse to make a lacy shawl. These are gorgeous! like so many before me, i love lacy shawls!! While I like a lacy shawl, I do love me a lacy pair of socks! I love long, lacy scarves. I really like small shawls and scarves to wear to work. They provide a little extra warmth, and add a pop of color to my mostly neutral wardrobe. I too like the look of lacy shawls. Need lots of practice to read the charts! I love Tanis and her yarn!! I shall be delving into some this fall for some shawls for certain! Love looking at lacy shawls. Would love an opportunity to win the ebook. I like lace in scarves, socks, and mittens. I’m just not a shawl person; they don’t “go” with my personal style. I like lace shawls or lace socks. Shawls and cowls are my lace items. Love them all. I have been wearing lacy cowls this winter as it’s so quick to throw on & then double up when I am cold. I love lace shawls. But I just made the most fabulous lace knee socks ever, and they are my current favourite. I hope you read this and realize I’m not entering the contest or giveaway or whatever it is haha. I’m 14 years old and I’ve been knitting socks with worsted weight yarn since last year. I decided to take the plunge with actual sock yarn last week, and I can report that one week later I have a completed sock with your ribbed sock pattern. Thank you very much for the easy-to-read pattern, I could follow along perfectly and since I’m a beginner that’s a great thing. The second sock is now in progress and they are so comfortable! Thanks again! I really like knitting lace hats for myself and lace shawls as gifts 🙂 I’ve been in love with this collection and think that I could make so many different versions for gifts for the holiday season! I love lace shawls and those are absolutely beautiful.! I’ve been beginning to knit more lace recently. I just completed my first lace shawl and lace cowl this summer. What fun! I love to knit lace shawls. I love to wear lace socks. I am still a newbie kntter so have not attempted lace stitches yet. This would be a lovely addition to my little knitting library. I like making shawls but prefer wearing scarves. I love lace shawlettes—not too big , just right! Rectangular lace stoles & lace scarves! Perfect for too much A/C at the office & not enough heat in winter. I’m partial to anything lace, but I do particularly like them in shawls & cowls. I love lace gloves, but unfortunately, they don’t seem to fit into my lifestyle right now. If only I’d started wearing them when I was a college student…. but I have managed to fit lace shawls into my life, so maybe I can adjust. Love knitting lace and love Tanis’s yarn…. can’t wait to see them together! I really like cowls and so do my daughters and your pattern is beautiful. I’ve tried knitting a lace pattern only once and wanted to poke my eyes out w/ my needles! The patterns make me want to try again…… and SUCCEED! I love lace patterns, and I love socks and fingerless gloves, so lacy socks and fingerless gloves are great. They are little and so you don’t have to count as much too. I love lacy socks and mitts, but am just starting to get into lace shawls too. That top one is amazing! I am very new to lace knitting, but I would love to complete a shawl one day! Lace fingerless mitts have been amazingly warm. You wouldn’t necessarily think this to be true given the holes of lace. I’m sure yarn loft and a medium to small amount of holes have something to do with this. My favorite lace accessory to knit is the shawl because I can have multiple repeats in a round before learning a new row. To wear I like lace shawls, socks, and fingerless mitts. My favourite lace accessory is a ‘shawlette’, a smallish shawl, especially if it’s a bit fitted so it sits comfortably on my shoulders but only comes down to about elbow length. Shawlettes are fairly quick to knit but there are a lot of different ones out there in all different levels of difficulty; they’re exactly the right size and weight for the evening but are small enough to fit in a (medium-sized) handbag for carrying around during the day (in case you need something in an over-air-conditioned shop or cafe). I have a beautiful lace shawl knitted with love by my sister. Time I returned the compliment I think. What a beautiful giveaway, love lacy shawls , they really dress up a plain outfit, and interesting to knit, and some not as hard as they look. Lacy shawls are so beautiful! I like the lace cowls and the shawls that you can wrap around your neck. My favorite kind of lace is definitely a shawl! I am a big fan of semi-circular shawls for my lace knitting. I love lace shawls, but have also started to do more and more socks. I just plain love lace! I have shawls and cowls and socks and my eye is always drawn to the patterns to do more lace! Pick me! Pick me! I love lace in all its forms… but have just finished one lace shawl and cast on another immediately, so that’s the current fave. Love lace gloves too though. These are simply beautiful-I would love to make these! Shawls seem to make one feel feminine and serve functional purposes as well. Thank you for your give-away. Living in Florida….shawls are lovely, but I can’t really where them all the time. My favorite lace accessory is an over sized scarf. Something I can wear on our 2 days of winter and light enough that I can cover my shoulders if needed in the summer. I just finished a Garden of Allah shawl, and I love it! I’ve also made a Hairuni, and crocheted 2 All shawls and a Serephina! So I guess it’s shawls! I love a lace scarf-usually both warm and pretty. What a lovely e-book! I’m somewhat new to lace. I’ve made a couple scarves and a sweater that had lace patterns. Really, any accessory looks good in lace. I especially like to see worsted weight yarn worked in a lace pattern. I think scarfs or shorter shawls (worn like scarfs) are my favorite. Lacy Cowls are my particular favourite. This collection is stunning. I don’t know that I’ve made a decision that way yet. This year I decided to make two lace shawls (at the same time) – one of them being your Lakeshore. I’ve done lace socks before and lacy gloves and scarves. I think I just like taking the patterns and using them for different projects. The more I learn the more I can create! I’m still pretty new to lace knitting. I love a good lace scarf though! To wear I love lace shawls, to knit socks, but I don’t like to wear them. I think I just need to get used to the feel of them. I will work on that.I Love lace cowls, maybe that is my favorite. I’m a pretty new lace knitter. I have been on shawl jag for awhile now as I try to work on my lace skills. Lacy shawls – so many ways to wear them. I was admiring Adhara on Tanis’ website when I ordered my yarn for your Lakeshore shawl, which I finished in time to give to my mother in law for her 90th birthday. I am just starting to knit lace. I am working on the Lakeshore Shawl with Needles in the Hay KAL.. It is certainly teaching me patience. I am no where near where the rest of the group is. However, I know when it is done, I will love it! I have not been able to knit a shawl yet, I simply haven’t found a pattern I like enough to give it a try. All my knitter friends tell me once you knit your first shawl you can never stop. I would love to knit a shawl and these two are beautiful. I’ll have to agree with a beautiful lace shawl as a favorite. I’d love to be able to knit one! I’m pretty new to lace knitting, but so far I’m enjoying shawls and stoles. I have really been wanting to get into makin shawls. I love scarves but they’re not always practical, so a nice, lacy, lightweight shawl seems like a perfect compromise! I love just about everything Tanis is involved with, but my favourite of this collection is the Solaria. Just so lovely! I’m still pretty new to lace, but knit a nice shrug a few years ago that worked out well. My first shawl was done this year and it was so pretty I had to gift it to a friend in ‘need’. My first venture into lace knitting was a cardigan……it is stil a WIP and calls out to me . I do love shalls though and have found socks are a nice way to practice some lace techniques without being overwhelmed. I love lace socks and hand warmers, and have made a huge pile of them to give away as Christmas presents for my family and friends. Would also love to learn to knit huge lace shawls. I think a cowl would be a great place to start for me, although eventually I would love to knit lace shawls for my three daughters (they are still young so maybe I have a decade or so to practice). I have successfully finished one shawl, and i have on on the needles as we speak. I really like Suncrest because I am not so tall, (darn it) and sometimes shawls are too large for me. I just finished my first lace shawl. It was the Summer Solstice Mystery Shawl over on Ravelry. So much fun! Lacey cowls and shawls are just lovely! 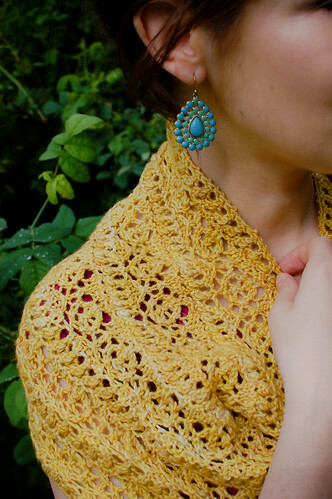 I love the look of the lacy shawls, but have not tried knitting lace yet. Ah, one of these days!!!! Lace shawls & scarves are the best in my opinion. I love lace socks and cowls. My preferred lace is a rectangular stole or scarf. I think I like lace shawlettes the best; interesting to knit, fun to wear. A second would be lace cowls. I love to knit lace cowls, so fashionable at the moment but easy to wear. Wow, these are amazing! Thanks for the chance! I love shawls but have begun to branch out into other things. I’m even considering being brave and knitting a lace cardigan! I’m just beginning to knit lace, but my prediction is that I’ll develop a preference for lace cowls. These shawl patterns look beautiful! A cowl is such an easy add on to brighten up an outfit, that’s my vote! I’ve gotta go with lace socks. I’ve knitted a lace baby blanket for my niece’s baby, and a lace scarf or 2 for my mom. I started a shawl that has never been finished. I’ve even knitted several lace bookmarks for teachers. Still, my favorite lace thing to knit is socks…always 2 at a time on 2 circular needles. Lace shawls are the best, but I like socks too. Thanks for the give-away! So far, I’m loving lace shawls to wear at work. My second favorite way to wear laces is on my feet, sock form! I love anything lacey and especially shawls…..
My favourites are lace shawls: great to wear in the office when the AC is on! So beautiful, I love Adhara! No question that shawls are the way to go! They can be so versatile. Lace shawls are both feminine and very practical! Lacy shawls are the best! I like lacy neck things, I feel like it allows the lace to be a warm layer but also easy to open up for a lighter layer. I love lace, it’s such a challenge to kniw. would love to knit a cowl or a shawl. Little shawls are great but I also love a lace vest. i like little lace detailing on things like sweaters. sometimes i find huge, complex shawls a little too much to look at. they’re gorgeous, just a lot to take in. My favorite is a lacy shawlette. Perfect pop of color and texture without being overwhelming or heavy/hot. Thanks! I have a dedicated shawl/shawlette drawer in my apartment, because I love knitting them and I wear them constantly! I have been knitting lots of lacy scarves, but I am currently working on my first lace sweater project! All of these patterns are beautiful! As a newbie to shawl knitting, one of the things I love is it’s portability and compactness. It was a perfect companion on 2 recent 9 hour flights, and fitted straight in my bag. I also love the fact , that when you’ve done the tricky pattern row, you then get the simplicity of a purl row…and the cycle continues. I’m using a solid colour, but would like to try one with a hand dyed yarn. I love lace shawls/wraps. So luxurous-feeling. Both patterns are just lovely. My new Lakeshore has cemented my love for lace shawls. My absolute favourite thing to knit is lace shawls.I hope I never reach a point where I have enough! My favorite lace project is a shawl, although since I’m still relatively new to lace knitting, I’ve kept it pretty simple. Love love love that first shawl picture for this post. Gorgeous! Beautiful! My favourites are lace shawls, although my next is a lace wrap, which I think will be even more versatile for me to wear. Love lace wraps…well, truly anything that can be used multiple ways. Wrap or scarf, etc. Thanks. Christening gowns but shawls are the go to lace item. I’m attracted to lace shawls like a moth to a flame, but so far they are too ambitious for me even though I bookmark & favourite many patterns for them. I’m more successful in completing scarves & baby items with lace features. I love shawls, they’re so beautiful and feel so impressive to make! I love lace and I love lace shawls! I wish I had more hands so I could knit all the things at the same time!! Lace shawls. I have so many patterns in the queue that it’s ridiculous. I’m a shawl whore. If I was told that I could only knit one item for the rest of my life, I’d choose shawls and be very happy. I love the shawlettes. Beautiful with lace. Shawls! I mean cowls! I mean hats! I usually have a big thing for cowls, but I love the Suncrest shawl in this collection! I find lacy scarfs more practical than shawl because they fit better inside a coat. I love lacy mitts with long arms but haven’t made any yet. I’m hooked on lace shawls! I love lace scarfs and shawls! Working on my first lace shawl and hope to make more. Love your blog! Thank you for sharing. I like lacy shawls and shawlettes. I had an aunt Stella! For me, it’s a lace shawl. Wow beautiful! Lace shawls are my favorite. I love how a bit of lace can dress up tshirts and jeans! Lacy knits for a bit of warmth in Alaska! Lace shawls are my obsession! I have always wanted to knit a lace shawl… this could be my opportunity… I am a novice when it comes to lace, but very keen to learn! Thanks for a lovely giveaway. I love knitting lace shawls…they are just so beautiful and feminine! Definitely love lace shawls. Fun to knit, and elegant to wear. I love to look at lace shawls but am more likely to complete a lace hat! These are really nice patterns and it would be great to have them to inspire me to tackle more lace on a shawl. I really like lacy neck wear, be it small scarves, or cowls or shawls. I find that they really nicely offset a more casual clothing choice. I really like a large shawl, keeps you toasty and looks great! I love the lace shawls just like mostly everyone! My favorite lace accessories are shawls and scarfs… I’m so ready for fall!! I love those long, shallow lace scarves/wraps that you can wear in a million ways. I’m all about the lacy scarves because they are so versatile! I love cowls, they’re less fussy to wear and can be very elegant. Lace shawls/scarves are my favorite lace projects. I just finished Nefertim, a semi-circular shawl. I love it! I love shawlettes and fingerless gloves…. Keeps me warm …..I’m Loves2Dance on Ravelry. My entire wedding dress was lace! It’s no accessory, it’s a standout in my book. Thanks for the chance! Shawlettes are like knitting crack to me. Impossible to resist! I must say I am not very original. I like lacy scarves/cowls/shawls. Yup, yup I do. I realize I said three things there, but aren’t they all cousins? Scarves that have different shapes and are sometimes continuous? I love all lace, especially shawls. Hoping to try a lace top soon. I love lace shawls! So pretty and delicate! I love cowls! They are just so nice the way the lay around the neck! Shawlettes – just a little something around the neck. I’ve knit some hats with lace, and scarves, and a shawlette, but I’d really love to try a tablecloth! My great-great-grandmother crocheted one when she had arthritis so bad that she couldn’t even feed herself, and I am working up to that challenge! I have not yet knit with lace or made a shawl so I’m not sure about my favorite accessory. This shawl is so beautiful and I would love to make it for myself. Besides sox, all my knitting has been for my kids. (Sweaters, wool pants, wool shorts, hats and scarves and doll clothes.) I would love the excuse to knit something beautiful for myself and learn some new techniques. I love lace shawls and cowls, but also beautiful fingerless mitts. So fun to make matching mitt and cowl sets, always a wow! gift.